BUSCH Table Banding Machines with step motor drive are supported with funds of "Europäischen Fonds für regionale Entwicklung". The proven BUSCH Ink Mixers are no longer manufactured due to falling demand. 1977 - over 40 years ago - the first Ink Mixer model FM 5 was sold to a customer in Germany. Approximately 2000 machines should follow until today and were delivered to customers worldwide from Mexico to Hong Kong. The very last machine was sold to a customer in Myanmar. New machines are no longer available. Spares, such as containers and mixing arms will be available for all models further on. 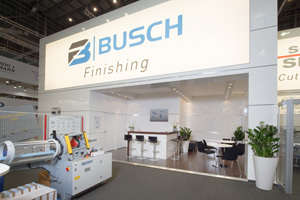 All machines made by the BUSCH group are developed, manufactured, assembled, electrified and put into operation at the works in Seevetal and Buchholz in northern Germany. Even when selecting our component suppliers we attach great importance to German-made products. 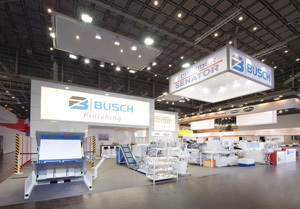 For more than 50 years BUSCH and SCHNEIDER SENATOR produce finishing machines for the graphic industry in northern Germany. 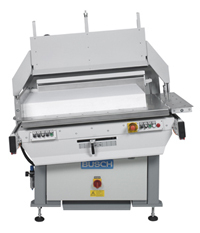 As a consequence of the takeover of SCHNEIDER SENATOR in 2009 the BUSCH group delivers complete cutting systems. 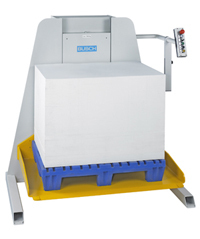 Guillotines, die-cutting machines, pile turners, machines for loading and unloading guillotines, an effective binding technique as well as tailor-made solutions for paper waste disposal form our common product range. Advanced technology and highest quality requirements for development and production are the basis for the outstanding durability and reliability of our machines. Customers and business partners appreciate our quick and reliable service. The proven product quality is based on solid engineering ‘Made in Germany’. Production parts are produced in our in-house machining. 100% of the mechanical processing of castings as well as the complete assembly and electrification are also performed in our German plants. Our long-standing in-house competence guarantees highest production quality. With expertise, proficiency and experience our qualified employees ensure the high quality standards which are praised by our loyal customers and business partners worldwide. 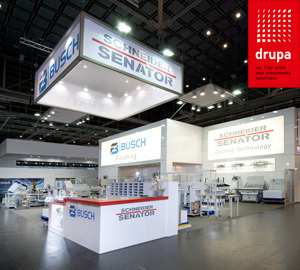 Already for the 14th time since 1958 BUSCH participated at drupa and therefore is one of its long-established exhibitors. This year, though, the company presented itself with a new, recent logo and a corresponding modern booth in the newest and probably most modern hall 6 of the exhibition grounds in Dusseldorf on a shared booth with their subsidiary SCHNEIDER SENATOR. On approx. 200 m2 both German quality brands showed their sophisticated and optimally interlocking product portfolio for print finishing with die-cutting and banding machines, pile turners, waste conveyor systems as well as guillotines with complementary peripherals. A special highlight of the presented BUSCH-novelties is the new pile turner generation Speedturner® 2020. It appears not only in an attractive design and with an improved user friendliness, but especially brings the airing function to perfection for smooth print preparation as well as for a faster finishing process of printed piles. Moreover, in the field of banding technology especially two developments have enthused the visitors: the new models of the table banding machines TB 26 I & II were highly praised for their new, modern design and their optimized user friendliness. 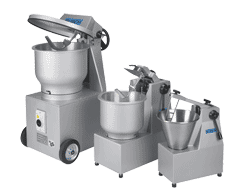 Highly popular have been also the frequently inquired and perfected feed banders ZFB 32/75 and ZFB 32 Inline with improved product positioning and alignment, intuitive touchscreen control and faster tape reel exchange. The date for the next drupa is already set: from June 23rd until July 3rd, 2020 the industry for print and cross media solutions will meet again in Dusseldorf. The BUSCH group has already made a note of this date. We recommend you to do likewise. At the beginning of DRUPA year 2016, the Gerhard Busch EBB GmbH introduces a new company logo. The redesigned logo replaces after 25 years the well-known BUSCH company logo and dispenses with the term “Graphische Maschinen”. This significant change represents the global activities for which the Gerhard Busch EBB GmbH has been known for since company foundation in 1949. Core element of the new logo remains the BUSCH lettering. Together with a stylized “B” the reworked logo is more compact and modern. 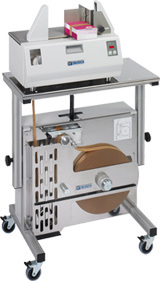 The machine used for banding all types of print products with Kraft paper coated on one side (brown or white) or with transparent polypropylene foil (PP) in tape widths of 20/30 mm or 40/50 mm. As is known, Busch assumed since 2009 the responsibility for production and sales of Schneider Senator cutting machines - one more reason to develop new peripherals. The new pile hoists and joggers have been exhibited the first time at drupe 2012. Production and sales are carried out in Seevetal, especially in addition to the Schneider Senator program. Pile hoists are produced in three sizes, joggers in two formats. Both products are manufactured according to latest findings with modern and precise technology, robust and solid in top quality. Busch manufactured already 40/50 years ago pile hoists and joggers. Today both machines represent a perfect supplement to the product pallet of Busch – Schneider Senator.